This is great news. Congratulations to all of you! There are so many great voices in that book. 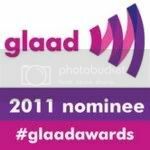 And congratulations again to Rod for your GLAAD nominations. How many is this again? This is beautiful. It is always wonderful to be reminded that our lives as black men who love men, matter in the world today. We should always remember that we matter. Maybe when that happens we will stop giving others the power to devalue, and make us take our lives. We are worth more than gold, than awards, than anything of material value. Our souls are priceless. I pray we remember that, Books like this help us to remember. I pray for many more so we can continue to tell our stories and make our voices heard to each other, and the world. "For Colored Boys" is an excellent book. I was reading it last fall during a dark time in my life and the stories were so inspirational. Congrats to Keith Boykin and all the writers! And congrats to Rod for your GLAD nominations and Ebony! Loved the book! Thank you so much and congratulations to Keith Boykin, Rod and all the writers!